Well, the results of DeMarcus Cousins‘ MRI are in, and they’re not good. As first reported by Shams Charania of The Athletic, then confirmed by the Warriors, it’s a torn left quad. Cousins is likely done for the rest of the postseason. As you can see, if there is any halfway positive news to cling to, it’s that the injury isn’t expected to require surgery, and according to Chris Haynes of Yahoo Sports, there is faint optimism that Cousins could return by the NBA Finals, should the Warriors make it that far. But don’t count on it. Further clarity as to the severity of the tear is likely more about how long Cousins will be out in addition to these playoffs. How many months of rehab are we talking? Can he be ready to go by the start training camp next season? Ultimately, how will this impact his free agency this summer? To that last point, there are, of course, two prisms through which this news can be viewed: What does it mean for Cousins, and what does it mean for the Warriors? For Cousins, it’s devastating. Sure, it doesn’t appear that he’ll need surgery, so it could be worse. But he’s still, at the very least, in for a second straight stretch of tough, prolonged rehab, and as such, he once again faces an uncertain future as a 2019 free agent in what will likely be, yet again, a depressed market for his services. Indeed, that’s a big part of what this season with Golden State was supposed to be about for Cousins: One, prove he was healthy, and two, prove he could drop the perceived attitude and be a contributing member of a championship team. Remember, for all his statistical success, Cousins had never played in the playoffs. Now, for all intents and purposes, he still hasn’t. He finished with nine points, nine rebounds and a team-worst minus-17 during his 21 minutes of Golden Stats’s Game 1 win over the Clippers. He went down early in the first quarter of Game 2. As you might recall, Cousins was probably going to be in line for something close to a max contract last summer before he tore his Achilles in February of 2018. It happened just as New Orleans was starting to look dangerous with Cousins and Anthony Davis as a potential long-term, twin-tower future. Oh how things change in a blink. The Pelicans, or any other team for that matter, didn’t offer anything close to the $170 million extension for which Cousins was in line, and instead he had to settle for a one-year, $5.7 million deal with Golden State. Again, the hope was that he would play well enough, and look healthy enough, with the Warriors to recoup at least a decent chunk of that money this summer. Now, that is once again in jeopardy. Cousins did sign a max extension earlier in his career with the Kings for right about $62 million, and he’s made over $78 million in his career. So he’s not going to be in the soup line any time soon. But as of right now, he has, very conservatively, missed out on somewhere north of $100 million. That mid-level exception will be in the neighborhood of the $5.7 million he signed with Golden State for this summer. In fact, this injury might have actually increased the chances that Cousins remains with the Warriors next season. When he was playing pretty well and looking like some team was going to offer him a pretty good amount of money, the Warriors weren’t going to be able to afford him. Perhaps now that has changed. 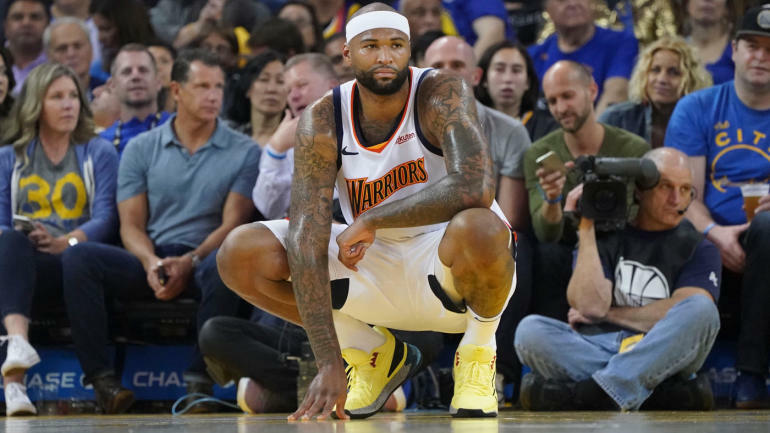 All of which begs the question: Should the Warriors want Cousins back? Nothing against him. He hasn’t been any sort of distraction or locker room problem. He was clearly willing to adjust his game to fit, as best he could, within the Warriors’ system, and all told, he was doing a pretty decent job, having averaged 16.2 points and 8.2 rebounds in his 30 games this season. Perhaps whether Kevin Durant stays or goes would determine Golden State’s interest level in retaining Cousins, but that’s all down the road. The question right now is: Are the Warriors better or worse off without Cousins for the remainder of these playoffs? It’s a fair question. Cousins has been exploited defensively in spots this season, and a team like the Rockets would definitely have been licking their chops to get Cousins switched out onto the perimeter to guard Harden and Paul one-on-one. That said, Golden State could have seemingly used Cousins’ ability to post smaller players on the offensive end with all the switching Houston does, and besides that, the Warriors’ defense hasn’t exactly been stellar so far in these playoffs independent of Cousins. He didn’t play a single minute in the second half of Game 2, and Golden State gave up a ridiculous 85 points to the Clippers in those 24 minutes en route to blowing a 31-point lead. A lot of that credit goes to the Clippers. Lou Williams is flat-out one of the best shot-makers in all of basketball. And Montrezl Harrell is a beast. Those two dudes combined for 61 points in Game 2 after combining for 51 in Game 1. They are a problem in the pick and roll, one of the most productive duos in the league, in fact, despite both of them coming off the bench. They could very well finish one-two in the Sixth Man of the Year race. Still, championship defenses don’t give up 85 points in a half. Championship teams don’t commit 22 turnovers, even if a lot of them were with a giant lead when a certain amount of sloppiness might be understandable. And what about Kevin Durant only attempting eight shots? Yeah, he went to the free throw line enough to still end up with 21 points before fouling out, and yes, Patrick Beverley deserves credit as one of the all-time pains in the neck. But this is Kevin Durant we’re talking about. Eight shots? Nine turnovers? In a playoff game? Look, it’s important to keep perspective here. The Warriors looked pretty damn unstoppable through the first six quarters of this series. They let their guard down with a 31-point lead and got caught. There is no reason to believe they are in any kind of danger in this series against the Clippers. But then again, they haven’t exactly been a model of consistency this year. Late in the regular season, I asked Kerr about the Warriors’ defense, which had been absolutely average, nothing more, all season, and whether he thought they could “flip the switch” in the playoffs. He said this team has proven it can turn it on when it needs to, and through six quarters, they had done just that. But then two quarters erased it all, and now they’ve lost home-court advantage to the Clippers. And Cousins is out. And the Rockets are likely coming. Does any of this concern Steve Kerr?